Is your Child aspiring to be an Engineer, Doctor, any other Professional? Do you wish to fulfil your Child’s Dreams? The answer to this & all your Financial Needs is with Zoroastrian Bank. We have endeavoured to help the Parents out, to provide their children with a bright future & let them follow their dreams by way of Financial Assistance to enable the child to pursue their Higher Professional or Technical Education in India. The Education Loan would be provided to those Students who have obtained or want to pursue Admission to Career-oriented Courses e.g. Medicine, Engineering, Management etc., either at the School, Graduate or Post-Graduate level. Lowest Interest Rate @ 10.90% p.a. The Educational Loan Scheme aims to provide Financial Support to the Students for pursuing Higher Education in India. The main emphasis is that any Student is provided with an opportunity to pursue Education through entrance Exams such as IITJEE, CET, any state / National Level Examination to obtain Admission in premier institutes for the Career-oriented Courses e.g. Medicine, Engineering, Management etc., either at the School, graduate or post-graduate level. The bank will provide necessary Financial Support with affordable terms and conditions. The Loan will be made available to the Parent/s of the Student. The Student should have secured Admission to a Higher Education Course or will be applying through Entrance Test / Merit Based Selection process in recognized institutions in India (9th Standard / 10th Standard / 10+2 Standard / equivalent). Maximum Rs.5.00 lacs for higher Education in India. Effective ROI @ 6.03% # p.a. For Girl Student – Concessional ROI at 0.25% lower than actual. For Study in Prime Institutions - Concessional ROI at 0.25% lower than actual. For Meritorious Student (above 90 percentile) - Concessional ROI at 0.50% lower than actual. Note: Concessional ROI will be applicable for any one of the above criteria as per banks discretion. Fee payable to School / College / Coaching Classes. Purchase of Computer / Laptop at Reasonable Cost, if required for completion of the Course. Any other expense required to complete the Course - like Study Tours, Project Work, etc. Basically all expenses pertaining to the Education of the Student are covered. Repayment Period is between 36 - 60 EMIs. Maximum 100 shares of Rs. 25/- each for the Borrower/s. Nominal Membership for the Guarantor. CIBIL Score to be over 700 for the Borrower/s & Guarantor. 25 times the Net Take Home Pay for Salaried Individuals. 2.5 times of Cash Accurals (NPAT + Depreciation) for Businessmen / Self Employed Individuals. For Salaried Individual/s, ITRs for the Past Three / Two years or Form 16 of the Borrower/s & guarantor with the last six months salary slips. For businessman / professional, copies of Last three / two years Audited Profit & Loss & Balance Sheet, ITRs with Computation of Income for last three / two years. Statement of Accounts with other banks for last six months for the Borrower/s. Details on any current Loans availed by the Borrower/s with their Sanction Letter & up to date Loan statement. Details of Fees / Fee Structure & Course Details with duration of the Course enrolled in. Offer letter from University / College / Educational Institutes / Coaching Classes stating details of the Course and their Admission procedure. Latest Academic Mark Sheets of the Student. ECS Mandate / PDCs / Debit Standing Instructions to the account. The Loan can be disbursed in stages as per requirement of the Educational Institute in accordance to their Admission procedure. Reimbursement option available for the Current Academic year. 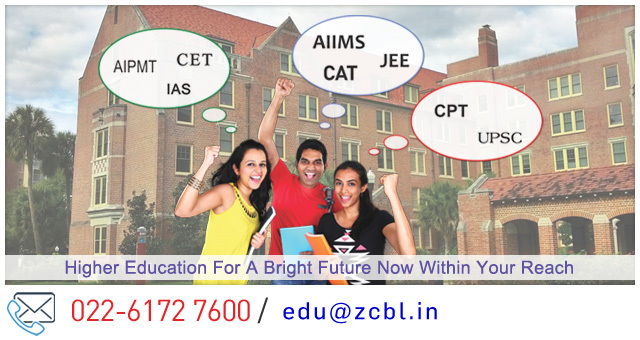 Student can apply through Online mode or log a query at edu@zcbl.in. Zero balance Saving Account opened for the Student and the Borrower/s. Get Income Tax Deduction benefit u/s 80E as applicable. * Can also be waived in exceptional cases. © The Zoroastrian Co-operative Bank Ltd. | Site powered by On-Lyne.